zFlick is a simple and elegant desktop app built for Adobe AIR platform that allows users to search and save Flickr images. 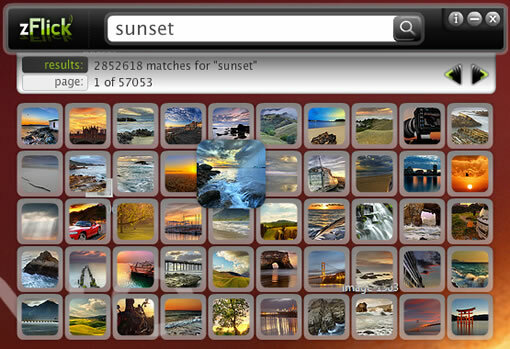 zFlick has a nice UI with transitions while searching Flickr images. zFlick not only allows to view Flickr images but you san save them to your desktop by simply drag and drop to the desktop. You enter a word in to the zFlick search bar and hit enter, it will display images from Flickr, it arranges images as thumbnails you can click on any image which opens a larger version of the image, clicking again on this will take you back to photo thumbnails. If you like a photo you can just drag and drop to your desktop to save that image. it is cool apps.. i’ve use it!